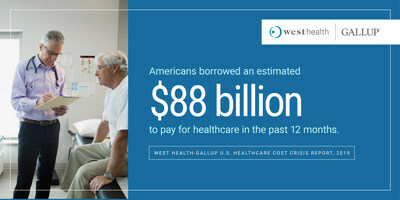 WASHINGTON, April 2, 2019 /PRNewswire/ — Americans are borrowing tens of billions of dollars, skipping treatments and significantly cutting back on household spending to pay for basic healthcare, yet a wide partisan divide exists over their satisfaction with the current U.S. healthcare system and the quality of care it provides. These findings and more are based on a new survey conducted by nonprofit, nonpartisan organization West Health and Gallup, the global analytics and advice firm. 77% of Americans are concerned rising costs will significantly damage the U.S. economy. 76% expect their costs for healthcare will increase even further in the next two years. 15 million Americans have deferred purchasing prescription drugs in the past year due to cost. Nearly 3 million borrowed $10,000 or more to pay for healthcare in the past year. Only about one-third report that doctors discuss costs with them in advance of procedures, tests or treatment plans, or for medicine required to treat their conditions.